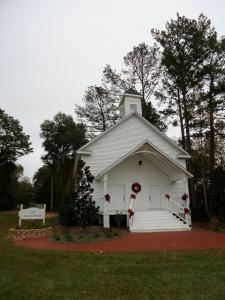 This lovely 19th century chapel in Clayhatchee is a place where wedding dreams come true. The building has been lovingly restored inside and out with a soft neutral palette to compliment any wedding style, whether it is rustic, country chic, or traditional elegance. Whether you choose to say your vows in the chapel, or on the picturesque front porch, we can help you create a beautiful memory for you and your guests. Rose Cottage, located just across the street, provides dressing area for the bridal party, restrooms, and a kitchen. There is also dining space for small receptions or parties.